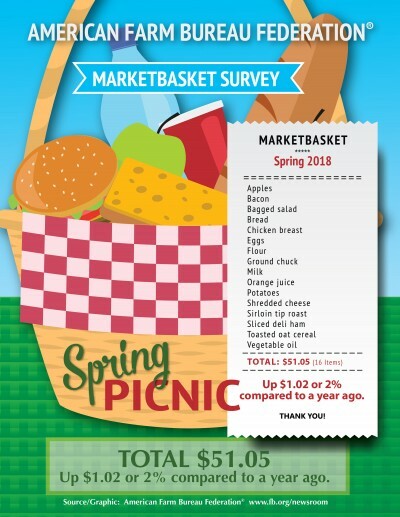 Higher retail prices for several foods including eggs, orange juice, meat products, bagged salad, shredded cheddar and vegetable oil resulted in a slight increase in the American Farm Bureau Federation’s Spring Picnic Marketbasket Survey. The informal survey showed the total cost of 16 food items that can be used to prepare one or more meals was $51.05, up $1.02 or 2 percent compared to a year ago. Of the 16 items surveyed, nine increased and seven decreased in average price. A bird flu outbreak in South Korea contributed to the increase in U.S. export volumes. “A surge in egg exports combined with relatively flat production led to the strong rise in retail egg prices,” Newton said. “Orange juice was another significant driver for the increase in the basket, up 24 cents or 7.5 percent. A devastating hurricane late last year that came through parts of Florida, where most orange juice comes from, led to growers harvesting the smallest crop in 70 years,” he added. Several foods showed modest retail price decreases from a year ago: whole milk, white bread, chicken breasts, toasted oat cereal, apples, potatoes and flour. Milk decreased in price by 6 percent (20 cents per gallon) due to continued record production volumes in the United States and a very competitive beverage case. Price checks of alternative milk and egg choices not included in the overall marketbasket survey average revealed the following: half-gallon whole regular milk, $2.04; half-gallon organic milk, $4.24; and one dozen “cage-free” eggs, $3.53. The year-to-year direction of the marketbasket survey tracks closely with the federal government’s Consumer Price Index (http://www.bls.gov/news.release/cpi.nr0.htm) report for food at home. As retail grocery prices have increased gradually over time, the share of the average food dollar that America’s farm and ranch families receive has dropped. “Through the mid-1970s, farmers received about one-third of consumer retail food expenditures for food eaten at home and away from home, on average. Since then, that figure has decreased steadily and is now about 14.8 percent, according to the Agriculture Department’s revised Food Dollar Series,” Newton said. AFBF, the nation’s largest general farm organization, began conducting informal marketbasket surveys of retail food price trends in 1989. The current series includes a spring picnic survey, summer cookout survey, fall harvest survey and Thanksgiving dinner cost survey. A total of 93 shoppers in 23 states participated in the latest AFBF survey, conducted in March 2018. According to USDA, Americans spend just under 10 percent of their disposable annual income on food, the lowest average of any country in the world.